Rhys McKee marked his Cage Warriors debut with a first-round stoppage win over Jefferson George in Cardiff. The Ballymena Mixed Martial Artist ended the contest with 16 seconds left in the round after a flurry of strikes against the cage. "I felt him break, I felt him fade - I had too much power," the 23-year-old told Cage Warriors. However, Belfast's Joe McColgan suffered a first-round TKO loss to Jai Herbert earlier on Saturday night. Both men exchanged strikes on the feet before Herbert rocked McColgan with a series of punches. 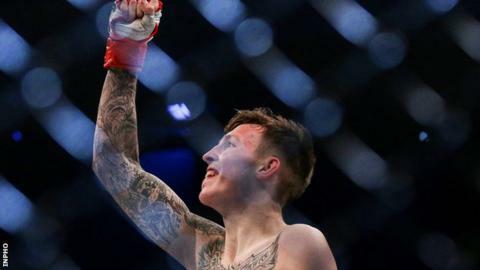 The 32-year-old was unable to recover and referee Marc Goddard stopped proceedings with exactly two minutes gone in the round. It was McColgan's first fight since September 2017 and a second defeat in his pro career. Meanwhile, McKee took his professional record to 8-2-1 with victory over George. George attempted several take downs in the round but McKee was able to recover his position and scramble to his feet. The Englishman appeared to slow down towards the end of the round and the Northern Irish fighter took full advantage. A sharp left hand did the damage and McKee finished the contest claiming a TKO win.